Although there is no shortage of Lada Riva's in Western Europe, coming across one of these boxy sedans in the US is very rare. We found this modified example for sale on Ebay with a buy it now price that could probably get you several dozen Lada's in many other parts of the world. To be fair, this isn't just any Lada Riva, it's only had one owner since new and the 18,553 miles advertised are said to be original. Despite being a low mileage car, this 1984 model has seen its share of modifications. A turbo was added to the engine, a 5 speed transmission from a Fiat Spyder was installed and seats were stolen legitimately acquired from a Lexus SC 430. The result is a strange vehicle guaranteed to confuse Americans who are unfamiliar with the genius of AvtoVAZ. 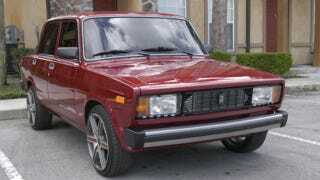 If you want to experience the no doubt neck-snapping performance prowess of this turbo Lada, it will cost you $30,000. That price may seem steep (and it is) for a vehicle that can be bought in different parts of the world for a very small fraction of the asking price, but if you are an American that can't live without a one owner turbo Lada Riva this could be your only chance.